Irish pubs are associated with a strand of consumer capitalism that relies on the global commodification of culture, the export of ethnic stereotypes, and the creation of experiences that can be consumed along with more conventional forms of consumption. 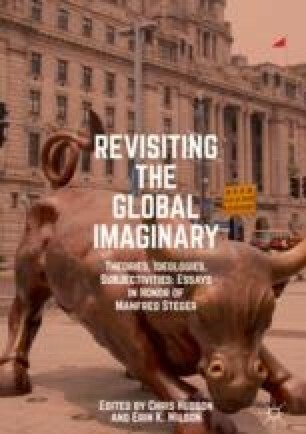 The production of an imagined Ireland in hybrid spaces which are anchored in the immediacy of the local, but also constituted through global connections, can be best understood through Manfred Steger’s concept of the global imaginary. This chapter focuses on the material and semiotic practices in Irish pubs across the world that produce spaces that are simultaneously both local and global, and which generate a global imaginary and global sense of belonging. Clarke, Donald. 2013. Who Will Set Us Free of This Horrible Entity: The Bogus Irishness of Craic? The Irish Times, June 22. http://www.irishtimes.com/culture/who-will-set-us-free-of-the-bogus-irishness-of-craic-1.1438746. Accessed 26 Sept 2016. Goodman, Conor. 2015. The Best Irish Pub in the World Outside Ireland Is … Healy Mac’s in Kuala Lumpur Is Named Irish Times ‘Best Irish Pub in the World’ (Outside Ireland). The Irish Times, April 27. https://www.irishtimes.com/life-and-style/generation-emigration/the-best-irish-pub-in-the-world-outside-ireland-is-1.2189367. Accessed 9 Sept 2017. Haddad, Sam. 2014. The Most Far Flung Irish Pubs in the World. The Guardian. https://www.theguardian.com/travel/2014/dec/15/irish-pubs-around-the-world. Accessed 15 Dec 2016. Hoey, Paddy and David Shaw. 2016. Here’s Why St Patrick’s Day and ‘the craic’ are Two of Ireland’s Greatest Myths. The Conversation, Australia. https://theconversation.com/heres-why-st-patricks-day-and-the-craic-are-two-of-irelands-greatest-myths-55783. Accessed 20 Oct 2016. Irish Network Japan. 2016. The 24th Tokyo St. Patrick’s Day Parade. http://www.inj.or.jp/en/event/24th-tokyo-st-patricks-day-parade. Accessed 20 Oct 2016. Kelley, Austin. 2006. Ireland’s “Crack” Habit. Explaining the Faux Irish Pub Revolution. Slate, March 16. www.slate.com/articles/arts/culturebox/2006/03/irelands_crack_habit.html. Accessed 23 Sept 2016. Lifestyle Asia. 2011. Best Irish Pubs in Singapore. https://www.dropbox.com/ow/msft/edit/home/Irish%20pubs/LIFESTYLE%20ASIA.docx?hpt_click_ts=1474518673972. Accessed 23 Sept 2016. Lonely Planet. 2017. Dublin Irish Pub. https://www.lonelyplanet.com/argentina/ushuaia/nightlife/dublin-irish-pub/a/poi-dri/1164913/363118. Accessed 28 Sept 2016. Myers, Kevin. 2010. The Day of Indulgence Is Done—The Time of Duty Has Arrived. Irish Independent, March 24. http://www.independent.ie/opinion/columnists/kevin-myers/kevin-myers-the-day-of-indulgence-is-done-the-time-of-duty-has-arrived-26643791.html. Accessed 23 Oct 2016. O’Neill, Brendan. 2001. We’re All Irish now. Spiked, March 15. http://www.spiked-online.com/newsite/article/11789#.V_xN5uB96M8. Accessed 23 Nov 2016. Pope, Conor. 2016. The Irish Pub Is a Status Symbol. With Unrest in the World, Everything Irish is Seen as Safe. The Irish Times. September 15. https://www.irishtimes.com/life-and-style/food-and-drink/the-irish-pub-is-a-status-symbol-with-unrest-in-the-world-everything-irish-is-seen-as-safe-1.2790913. Accessed 23 Nov 2016. St. Patrick’s Day and Night. 2016. Moscow, http://irishweek.ru/day-night/?lang=en. Accessed 19 Oct 2016. The Irish Pub Company. 2016. http://irishpubcompany.com/the-story-of-the-irish-pub-company/. Accessed 20 Oct 2016. The Irish Pub Concept. 2017. http://irishpubconcept.com/about/overview/ Accessed 20 Oct 2017. The Irish Village Dubai. 2016. https://theirishvillage.com/. Accessed 7 Nov 2016.